One of the most significant discoveries in paleontological history, Deinonychus Antirrhopus is sadly little known the general public, but is known well in the scientific community. Deinonychus is a quintessential raptor, slightly smaller than a person & among the most intelligent dinosaurs. There is a fierce debate as to whether Deinonychus & its kin were warm-blooded & even feathered. Deinonychus has given much support to idea of warm-blooded dinosaurs, & resurrected the theory that dinosaurs were related to & later ancestral to modern birds. 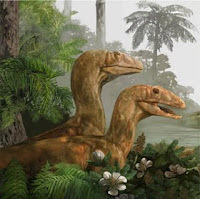 Which family between the Troodontids & Deinonychus' families the Dromaeosaurids gave rise to the birds is unknown. Deinonychus was discovered in 1964 by John Ostrom, & later much worked on by Jack Horner, in the badland sites of Montana. Deinonychus fossils were found surrounding a Tenotosaurus, suggesting Deinonychus hunted in packs. Contrary to popular belief, Deinonychus & other Dromaeosaurids did not use the sharpened, muscular claws on their feet to rip & disembowel its prey. Tests involving a resin replica of a Velociraptor claw combined with a jointed metal set of leg bones & a hydraulic press were used on various animal materials, showing that the claw could rip through human skin, but failed to tear a slab of pork & merely grazed a slab of crocodile flesh, barely removing a few sections of skin.